Soil loss is an unfolding global disaster that will have catastrophic effects on world food production, scientists at the United Nations Conference on Climate Change have warned. Speaking today (Wednesday 2 December 2015) at the 21st Conference of the Parties in Paris, experts from the University of Sheffield’s Grantham Centre for Sustainable Futures revealed that nearly 33 per cent of the world’s arable land has been lost to erosion or pollution in the last 40 years and vital action must now be taken to prevent the devastating knock-on effects. 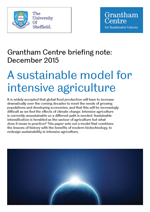 In a new report, the Sheffield scientists urge that a sustainable model for intensive agriculture is crucial to cope with the increase in global food production needed to feed the world’s growing population. Meeting this demand will become increasingly difficult as we feel the intensifying effects of climate change. At the moment, intensive agriculture is unsustainable – under the intensive farming system current crop yields are maintained through the heavy use of fertilizers, which require high energy inputs to supply inorganic nitrogen via the industrial Haber-Bosch process. This consumes five per cent of the world’s natural gas production and two per cent of the world’s annual energy supply. However, scientists have discovered that the key to creating a future sustainable model for intensive agriculture could lie in the past and even be supplemented by human excrement as an organic fertiliser. Duncan Cameron, Professor of Plant and Soil Biology at the University of Sheffield, said: “Soil is lost rapidly but replaced over millennia and this represents one of the greatest global threats for agriculture. “Erosion rates from ploughed fields average 10-100 times greater than rates of soil formation and nearly 33 per cent of the world’s arable land has been lost to erosion or pollution in the last 40 years. Colin Osborne, Professor of Plant Biology at the University of Sheffield and Associate Director of the Grantham Centre for Sustainable Futures, added: “Historically, good soil management was supplemented by the collection and application of ‘night soil’, which is human excrement – a practice that continued into the 20th century. “In a historical example of the circular economy, this closed the nutrient loop, recycling organic nitrogen and phosphorus back into soil. Managing soil by direct manure application, rotating annual and cover crops, and practising no-till agriculture (not cultivating and preparing the land). These practices connected to ‘conservation agriculture’ restore soil organic matter, structure, water-holding capacity and nutrients, averting soli loss while benefiting crops. Using biotechnology to wean crops off the artificial world we have created for them, enabling plants to initiate and sustain symbioses (close interactions) with soil microbes. These symbioses allow crops to exploit microbial biology to tap into soil organic nutrient reserves, and prime plants to better defend themselves against pests and diseases. Recycling nutrients from sewage in a modern example of the circular economy. Inorganic fertilizers could be manufactured from human sewage in biorefineries operating at industrial or local scales. A number of technical challenges impede the immediate adoption of this idea, but these can readily be addressed through research. Professor Peter Horton, Emeritus Professor of Biochemistry and Associate Director of the Grantham Centre, said: “In order to facilitate such a wholesale redesign of the agricultural system, we need to assess the potential scientific, economic, cultural and political impediments to this happening, and resolve the potential benefits of this redesign for sustainability. “In doing so, we could reduce our dependence on energy-intensive and non-renewable inorganic fertiliser, reduce fertiliser pollution of watercourses, and create a soil fit for future generations.